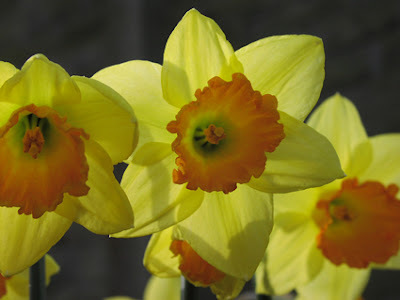 Today, March 16, is Mothering Sunday - or Mothers Day in the UK. It is a difficult time for those whose mothers have passed on. My own mum died a few years ago, shortly before Mothering Sunday. It felt as though every shop window and every advert I saw reminded me of my grief. But, as time went on and Mothers Days rolled around with the wheel of the year, I began to see the occasion as one on which to remember my mother and the happy memories I have of her, rather than an event to try to shut out entirely. I usually go into the garden and pick daffodils to put next to a photograph I have of her on my desk. I also light a candle for her and chat to her as if she can still hear me, telling her about things that have happened and that I love her. Many pagans believe in the importance of honouring our ancestors. Samhain is often seen as the most important festival on which to remember those who have gone before. That is something I do too - scrying for messages from friendly spirits from the Otherworld; ancestors of blood and place and tradition. But Mothers Day is reserved for talking with my mother. Of course I can never be certain whether she hears me. Even if there is life after death we can't tell if those who have passed through the veil are listening to us. However, it is well documented that those who have lost loved ones can gain comfort from trying to communicate with them, even if all we are talking to is our own memories and our image of them in the place they still hold in our hearts. Thank you for your kind words Lana. Grief does change with time, but you are right that the loss of one's mother leaves a lasting mark.